Every city in America has a main street. Many European cities do, too, but as many of them are round it’s sometimes hard to tell which it is. But that’s not a problem in Las Vegas. Fremont Street is it. Of course, those who walk The Strip will argue. 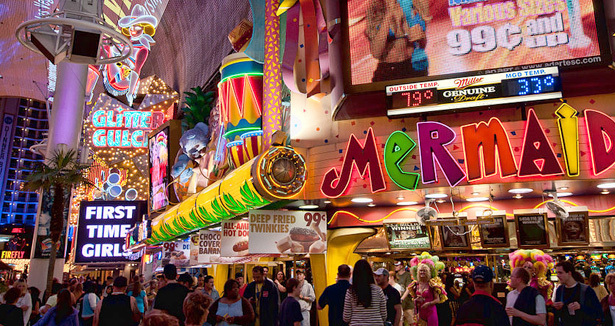 But visit Fremont Street and you’ll be convinced. New York has Times Square at Broadway where the neon lights astound visitors. Paris is appropriately nicknamed the City of Lights. But Las Vegas is unique. Nowhere outside Asia can you find such a dazzling array of sights and sounds, with crowds to match. Housed under a permanent canopy, the casino-lined street has over two million lights and a state-of-the-art sound system. The combined effect is, well, electric. Under the $70 million canopy walk a million visitors a year, if ‘walk’ is the proper term. On many nights, it’s more like being the ball in a pinball game. Not that it’s overcrowded, it’s just that you spend so much time trying to take in all the sights, you have to bump shoulders fairly frequently. Ninety feet above your head there are 12.5 million synchronized LED lights producing millions of color combinations, accompanied by animation and video. One second it may be a TV broadcast, the next an indefinable kaleidoscope that pops your pupils. Among the better known signs is Glitter Gulch’s Vegas Vickie, exemplifying everything that is Las Vegas. Kitsch, fun, carefree and silly. Videos are projected onto the canopy, too. Some last several minutes and run the gamut from ‘The Drop’, a psychedelic ‘happening’ ala the ’60s, to ‘Area 51′, showing earthlings in battle with aliens. ‘Above and Beyond’ gives visitors a view of the Earth from outer space, while ‘Fahrenheit at Night’ displays some of what Vegas is best known for: beautiful women. There are dozens of shops, everything from small indoor venues to free standing kiosks. Many of the offerings are just what you’d expect – little trinkets that will break the first time your child goes to play with it. But there is the odd interesting item here and there. If nothing else you can grab a doughnut at Krispy Kreme and enjoy the sights from the outdoor patio. The canopy is 1,400 feet (about 1/4 of a mile), so you’ll have plenty of opportunity to miss something interesting. Better plan to go twice, at least once when you’re sober.